It’s Feature Friday! 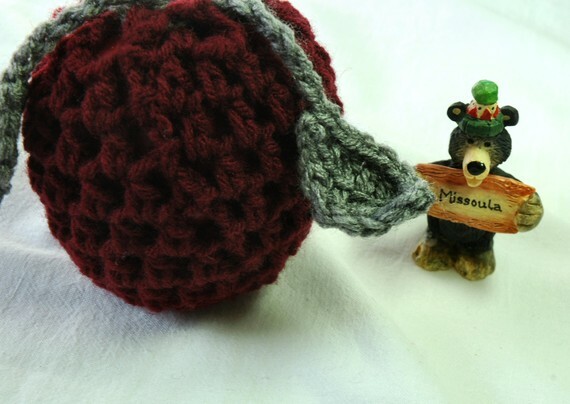 I would like to introduce you to my new friend Samira of Sam’s Crochet on Etsy! ~1. What is your name? I am from a bit of everywhere. I was born in San Diego, spent grade school in upstate NY, and a year back in California, before my family settled back in to the Willamette Valley in Oregon where my parents are from. I lived in Seattle for about 6 months, and Louisiana for a couple years. Back to Oregon for a handful of years, and now I’m living in Missoula, MT. I ADORE Missoula, and have had an awesome time here in Montana. I expect to stay here a long while with lots of trips back to Oregon to visit family. Go Griz! ~3.Tell me a little about yourself and how you got started doing what you do? I’m 26. I finished massage school last June, and hope to be licensed here in MT at some point in the near future. Health and fitness has always been part of my life. I spent afternoons doing homework in the back of aerobics classes while my Mom was up front teaching. Her studies have been in the medical field, and I have been browsing her books for years. Now I have my own selection of bodywork books. I started to crochet when I was about 8. My grandma taught me the basic stitches. The last few years, I have been crocheting more regularly, and have self-taught myself some more dynamic styles. The tattoo I have in the middle of my upper back. ~4.What type of items would I find in your shop? 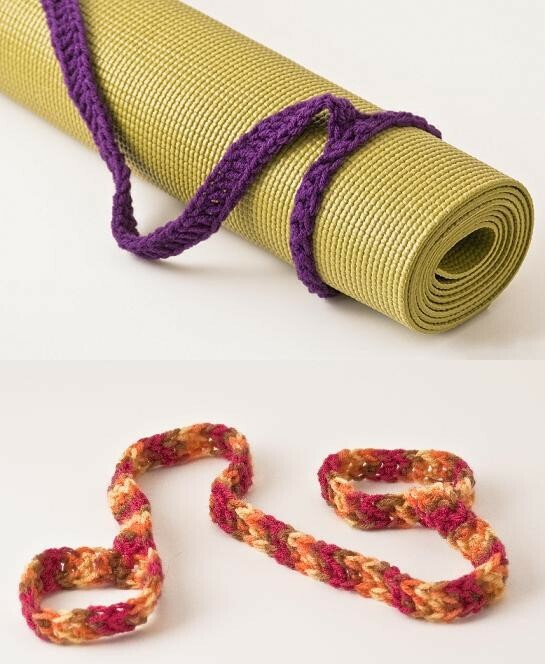 Handmade Health & Fitness: Apple Cozies to Yoga Accessories! Health and exercise accessories. 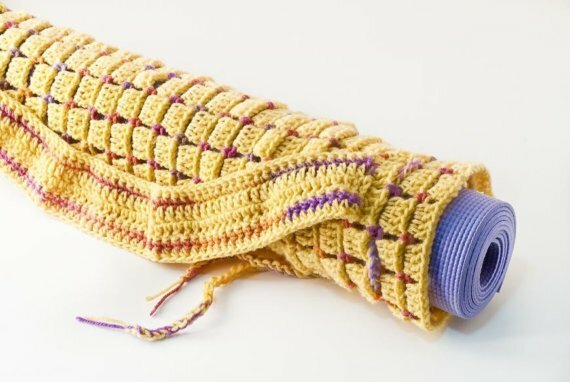 Water bottle and yoga mat bags, blankets and slings, apple cozies, and leg warmers, headbands, and beanies. ~5.How long have you been crafting? My aunt was a big yarn crafter, and loved both knit and crochet projects. As the only one in the family with a love of yarn, I was the one who received her closets full of yarn when she passed a few years ago. I have used almost all of her yarn, and am still going strong, so most of my sales will drop right back into the purchase of new yarn, so I can continue that which I love to do. I dabble in cross-stitch, and am working on my first knit scarf (started about 3 years ago). I have done some latch-hooking, and a bit or plastic canvas work. I think I’ve crocheted at nearly every one of my jobs. I was working front desk at a local gym, and had lots of time to crochet. Many of my customers would compliment my work and mention that I should sell my items. I eventually did some research online to see where there might be a good place to do so, and came across Etsy. 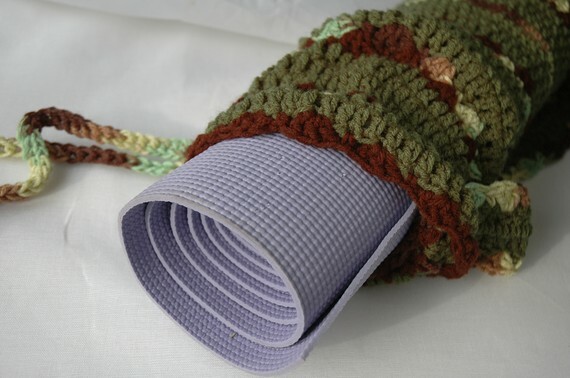 The very first item I made with health in mind, and not just hats and scarves, was a ribbed/spiral yoga mat bag. It was so much work, and way too bulky. I would have had to charge about 2x what anyone would want to pay for a bag. Lots of lesson learned though, and my mom got the first one in the style I currently create my mat bags in. ~6.What inspires you the most to create? I see items to be made everywhere. If I see something, I automatically work out in my head how I would recreate it. I do this especially for anything healthy and useful. Most of the new things I’ve done lately are customer requests. One of the most recent things I’ve recreated is a bag I use all the time which my best friend thought would be good for her mother in-law. First photo is the bag I use for my yarn projects. It’s a reusable wine bag that you can get at your local grocery store. I don’t go anywhere without Mountain Dew. The pink bag is my version that her yarn-using-mother-in-law loves! Her husband saw this bag, and requested a 6-pack Frisbee golf bag in a similar style. Things just seem to grow from previous samples. ~7.What is the one “must have” item you need with you when you create? I have yarn everywhere. If I emptied my space of yarn, it would be pretty minimalist. I have plastic tubs, drawers, and a couple laundry baskets full. I recently acquired a car-ful of hand-me-down yarn to overwhelm my little space. Organization is one of my fortes, though, so I mostly know where everything is. If I am not organized, I can’t get anything done. I’m the sort that cleans house before I can do anything, so I’m always rearranging, and sorting in my little space. 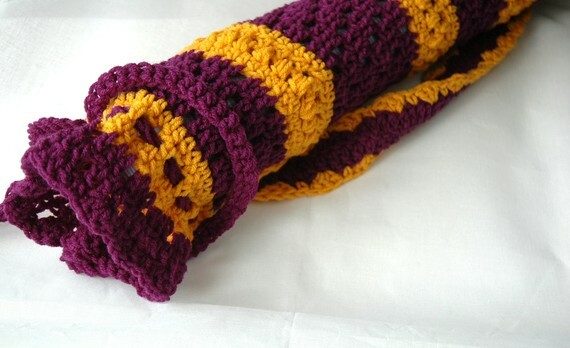 ~8.What is one of your favorite items from your favorites list on Etsy? My purchase from CamdenCreations has been my all time favorite Etsy purchase. http://www.etsy.com/transaction/43762996 I have been collecting items for my soon-to-be niece in this lovely fabric, and the apron is phenomenal. Reversible, customized, and will be well loved. I am a member of TradeAHolics, so I am always wandering new shops, and finding great new things. If you are a new shop and would like to increase your sales, and show some feedback, trading is a great way to do that! ~9.When you aren’t crafting, what do you do? ~10.Where can we find your shop? I have a few places where I have an online presence. I have been on Etsy since February 2009, and have recently added a shop at ArtFire, Storenvy, Big Cartel, CraftIsArt and Zibbet. I especially love Storevny. It is easy to navigate and mixes well with Facebook. Keep going. Work at your pace. Be the shop owner that you want to deal with when you shop. I work with the “if there’s time to lean, there’s time to clean” theory. There is always something you can do to improve your shop. My three daily goals are (1) Make Something (2) Sell Something (3) Tell Someone. When I first started it was mostly making, and telling, finding more online places to show put my link, show off a photo. I posted in the crochet FB links just to share what I’ve made, and to pull some ideas. The selling goal can be tougher, but I can often make a trade through the TradeAHolics team most days. This adds feedback and sales to my shop. One of the things I am most proud of is with nearly 400 feedback, not one has been negative or even neutral. I try to go above and beyond for each customer. Part of the sell something goal also, is to post a new listing everyday that I can. Sometimes that a renewal of a sale, and sometimes it’s another size of multi-pack option, just to get a new listing up. ← Check out this Awesome review by my new friend Erin on her blog!! Also featuring a Giveaway of Mama & Baby products! You have lovely organic offerings! And, thank you for your advise for etsy shop owners!